A few months ago, MoneyBeagle wrote about clearing out the spiders from his gas grill. 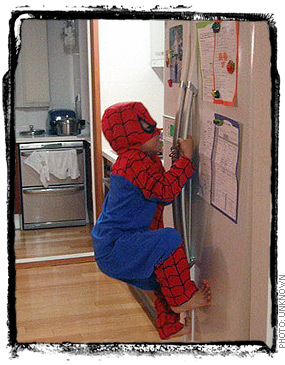 Don’t worry, this isn’t about spiders in or on my fridge. But his advice couldn’t have come at a better time for us. We don’t use a gas grill — opting for the old school charcoal method instead — but I was having an issue with another food related appliance at exactly the same time. My ice cream wasn’t as cold as it should have been. My house-brand grape soda was luke warm. Anyway, with the daycare bills crushing my finances and all of the auto trouble, and did I mention that I had to buy a new computer too yet? Well, anyway, purchasing a new refrigerator would just add insult to injury. Like I said yesterday, when I pretended to be an auto mechanic, this time I put on my appliance repair man hat. First attempt was just to jack the coldness setting up in both the freezer and the fridge. Sometimes it’s as simple as that but after a few hours, well, things were only getting warmer. Maybe I just needed to clean out that plastic vent/grill thing at the bottom of the door. I know that when I clean the air filter on the lawn mower that it runs better. Maybe it’s just too dusty for the fridge to do its thing. After a few more hours, I thought the coldness factor was a little better but still far from where it should be. Somewhat stumped, I decided to dial the coldness dials back to their original position. While trying with all of my might to turn one of the knobs, I pushed on the back wall of the inside of the refrigerator for more leverage and heard the sound of cracking ice. The knobs were now frozen into place. After pushing on the back wall here and there I concluded that there was probably so much ice built-up back there that the vent opening that cools the fridge from the freezer was probably totally blocked. So I pulled the whole thing away from the wall, unplugged the beast, left the doors wide open, grabbed a hair dryer, and some towels. After an hour or so of hair dryer action (the first action the hair dryer has seen in at least a decade), we loaded the fridge back up and plugged it in. My ice cream is hard as a rock now; just the way I like it. Your spiders saved me a fortune! Glad I could help. Our fridge has a problem as well that I need to fix. It is self-defrosting and usually drains into a pan under the fridge. That’s apparently gotten iced over (it’s a somewhat common problem in our model) so it now drains into the fridge! We have a tupperware container that I have to empty once a week or so, but our fix too will involve emptying everything and melting out that iced over drain line. Ugh.